When Chris and Sonia Arriola come home from work each evening this Lent, they'll return to their tradition of fishing through their pockets for a few dollars or a handful of change. The money will go to their two young children—not for piggy banks or trips to the candy store, but to deposit in the cardboard bowl that is placed the middle of their kitchen table. They impress on their children the lessons of charity, compassion and solidarity with those who are poor. The Arriolas are an Operation Rice Bowl family. Living in San Jose, California, Chris and Sonia come from immigrant families and see Operation Rice Bowl as a way of not only connecting their children with their Christian obligation to poor families overseas but to their own familial identity. "My mother grew up in rural poverty in Mexico," says Sonia, "and I think it's a challenge for our children to really understand what that means—growing up in America and growing up with educated parents…. Everyone they know has a home and has water and has heat, and…[we] remind our children that it isn't so across the globe." She adds, "We need to do everything that we can to support…not only our family, but others in need." Operation Rice Bowl is the Catholic Relief Services Lenten program that began in 1975 in the Diocese of Allentown, Pennsylvania, as an ecumenical response to the drought in Africa's Sahel. For more than 35 years, CRS Operation Rice Bowl has offered Catholics in the United States a way to connect with our global brothers and sisters in need through the traditional Lenten practices of prayer, fasting and almsgiving. Each Lent, nearly 13,000 parishes, schools and other faith communities across the United States participate in the program to demonstrate solidarity with poor people around the world. For Chris, it feeds into the beginning of his children's faith formation—introducing the Gospel commandment to love one's neighbor—and helps children with a narrow range of experience tackle the all-too-often-abstract question of who their neighbors are. "When you look at Operation Rice Bowl, they say, 'We're one human family,' and we love to say platitudes like that," says Chris. "[When] it boils down to what we are as Christians and Catholics, it's really trying to love everyone—and that can be really hard to do. But this is a way to remember other people who don't have what we have…. If that person were your brother or cousin or sister, would you really let them live that way?" In a small way, adds Chris, "we can say, 'No, we're not going to let them live that way. We're going to do what we can to help.' "
When people ask the Arriolas what they're giving up for Lent, Chris says he and Sonia encourage their children to give something for Lent. "Operation Rice Bowl's a nice way for us to give part of ourselves back for Lent," he says, "as opposed to seeing it as a sacrifice….We're seeing it as serving others, and we're going to incorporate giving into this Lenten season." Lent is traditionally observed through sacrifice. Lent is observed through charity. And Lent is certainly observed through prayer, and our mindfulness of how our brothers and sisters overseas are struggling is reflected in our prayer life. 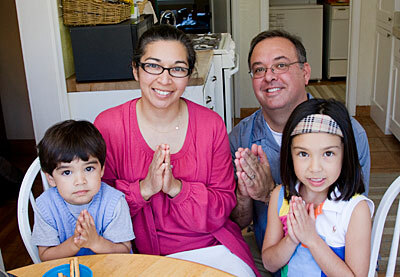 Operation Rice Bowl allows all these parts of a family's Lenten faith observation—praying, learning, acting and giving—to dovetail profoundly. When families like the Arriolas bring the simple bowl into their homes, they begin a process of spiritual growth for the family. The bowl reminds them to live out their faith mindfully as members of the worldwide family. They pray the Operation Rice Bowl Stations of the Cross to bring an international focus to this venerable Lenten observation. They prepare simple, meatless meals each Friday during Lent, using recipes from different countries. They contribute money to the bowl and turn in their donations after Lent ends. "Lent is a different time of year," says Chris, "and maybe it's time to do something a little extra special too. We can write a check and we try to—to food banks and Catholic Relief Services. This is a way for our kids to get it…. They can see a dollar bill or a $100 bill or a check, and they don't know the difference. But the quarters that they use every day to buy an ice cream—that they saved up, that instead they give, so someone can eat—I think that really helps them to understand what we're doing." But it's not just children growing in faith. Sonia is quick to point out that participating in CRS programs like Operation Rice Bowl helps the whole family live their faith more fully and respond to the Gospel. And the lesson for the children stirs their own mindfulness. "How a quarter in the rice bowl could feed someone for a day is something I just don't think we think about a lot, let alone our kids," says Sonia. "So doing that every day, letting [my daughter] know that she's helping to feed somebody is really a simple way for us to remind her that God wants us to help other people." "Catholic Relief Services is really an organization that puts faith into action," Sonia says. "We can take our children to Mass, we can send them to Catholic school. But the question is: When are they going to translate their religious education into action, into service?" She adds, "I think Catholic Relief Services is an extraordinary organization that travels the globe and says, 'Regardless of where you live, what your circumstance is, what language you speak, what religion you are even, we are here as humanitarians, we are here to help and to act as Christ did—to feed the hungry, to clothe those in need, to build shelter.' "
As their faith helps the Arriolas family grow in charity, the charity too helps them grow in faith—and, even more profoundly, in communion. "I think that too often people have in their minds that, when they contribute, it needs to be a material contribution of great significance," says Sonia. "And I think the thing that we love about Operation Rice Bowl is just that the little coins add up. And so it doesn't need to be one big check, but lots of people uniting in one common faith." Chris returns to his identity, both as a Catholic and a child of immigrants: "The Church talks about social justice and giving back. For us to sit here—and we're blessed that our ancestors were able to immigrate to this country and have the opportunity to live here, to make this money—I think that God has blessed us, that we have more of an obligation to give back, because we have so much." "Sometimes when I'm going to write the check…we talk about how much to give and I—I can't imagine if that was my child going to bed hungry, and how that would make me feel," Chris says. "And so I try to remember that, when it comes time to give—especially for Catholic Relief Services—it's for children and families."